Washington Blue Lion junior Garitt Leisure sets for the pull-up jumper during a Frontier Athletic Conference game against Jackson at Washington High School Friday, Jan. 25, 2019. Pictured for Jackson is sophomore Treylan Davis (2). 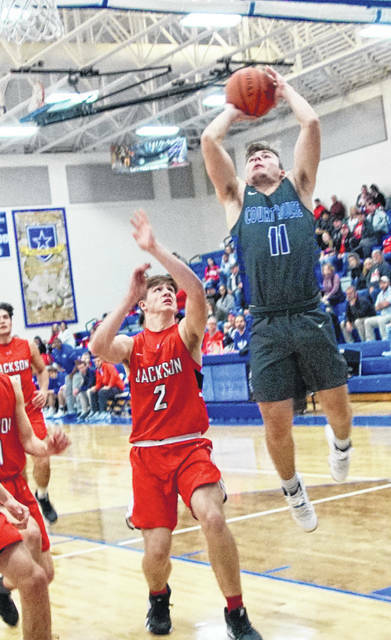 The Washington Blue Lions hosted the Jackson Ironmen Friday night for an FAC game that certainly had implications for the seeding of teams in the upcoming Division II postseason tournament. On this cold final Friday in January, the Blue Lions battled with the Ironmen until time ran out with the visitors posting a 52-47 victory. Jackson improves to 11-5 overall, 5-3 in the FAC. Washington is now 10-5 overall, also 5-3 in the conference. Senior Evan Upthegrove was the game’s leading scorer for Washington with 25 points. He hit three of his team’s four three-point field goals. Senior Blaise Tayese scored eight, senior Omar Porter had seven, junior Garitt Leisure had five (including the other three-point field goal) and senior Richie Burns scored two. Senior Cooper Donaldson led Jackson with 19 points. Junior Caleb Wallis had 13 for the Ironmen. “When we weren’t making shots, (Jackson) really packed it in early,” Washington head coach Connor Scott said. “It took me maybe too long to adjust and go to our secondary offense, which gives us more screening and passing options. “It starts on the defensive end for us,” Scott said. “When we get stops we can get out in transition and get to the rim. Though both teams shot 41 percent from the field, the Blue Lions seemed to miss an inordinate amount of lay-ups, including, at one juncture, three in a row on consecutive possessions. “I think we missed 11 or 12 lay-ups,” Scott said. The Blue Lions took a 4-0 lead with a couple of early buckets. Jackson held a 13-8 lead at the end of the first quarter. The Ironmen went on an 11-0 run that started with two minutes remaining in the first quarter and carried over to the 4:07 mark of the second period. A 12-2 run by the Blue Lions countered Jackson’s streak and pulled Washington to within two points, 22-20, with 34 seconds remaining in the first half. Jackson was in front, 24-20 at the halftime break. Washington regained the lead with 3:57 to play in the third quarter. The Blue Lions held a 33-32 lead with eight minutes to go. Jackson regained the lead early in the fourth quarter and the game stayed close down the stretch. Porter’s bucket and free throw made it 43-42, Jackson with 1:53 to play in the game. Donaldson answered at the other end with a layup and a three-point lead. Upthegrove scored to once again put Washington just one point behind Jackson with 39 seconds remaining. The Ironmen made seven of their final eight free throws and Upthegrove hit another three-point shot to set the final score at 52-47. Chillicothe clinched at least a co-championship in the FAC with a 58-39 victory over McClain Friday. The Tigers are now 4-4 in the conference and the Cavaliers are 7-1. Washington and Jackson are tied for third place in the FAC, both at 5-3. Also Friday, Hillsboro edged Miami Trace, 42-38 at Hillsboro. The Indians are 3-5 in the FAC and the Panthers are 0-8. The Blue Lions are off Saturday and will host Logan Elm Tuesday for senior night. “Our main guys just do it on a nightly basis,” Jackson head coach Max Morrow said. “We play hard and we stress defense. “Even though they took it at us and won the second and third quarters, we were able to still stand strong and grind out the win,” Morrow said. Jackson’s next game is Friday night against Miami Trace. It will be the Ironmen’s senior night. WASHINGTON — Evan Upthegrove 6 (3)-4-25; Miguel O’Flaherty 0-0-0; Blaise Tayese 4-0-8; Garitt Leisure 1 (1)-0-5; Omar Porter 3-1-7; Drew Moats 0-0-0; Richie Burns 1-0-2. TOTALS — 15 (4)-5-47. Free throw shooting: 5 of 8 for 63 percent. Three-point field goals: Upthegrove, 3; Leisure. Field goal shooting: 19 of 46 for 41 percent. Turnovers: 8. JACKSON — Matt Humphreys 0-0-0; Treylan Davis 4 (1)-0-11; Caleb Wallis 4-5-13; Evan Spires 1-0-2; Nevin Yates 0 (1)-0-3; Cooper Donaldson 8-3-19; Braxton Hammond 0-2-2; Griffin Brown 1-0-2; Brice Graham 0-0-0. TOTALS — 18 (2)-10-52. Free throw shooting: 10 of 12 for 83 percent. Three-point field goals: Davis, Yates. Field goal shooting: 20 of 49 for 41 percent. Turnovers: 9.